MADE IN THE US BY KRAFT TECH! Necks have a 30 degree rake and A no stretch in the front down tubes. Style neck, no stretch, and a 30° rake. Uses Big Twin triple tree with 1 neck. Can be used with either belt or chain final drive. For use with any big twin engine. Kraft Tech Frame w/ Certificate of Origin (MSO) Part# K16001D. 2 Under DNA Chrome Springer front end. DNA Front Springer Axle kit Part# M-AX-1000. DNA 4 Chrome Billet Risers w/ hidden bolt design Part # M-HR-1020. Paughco Chrome 16 Apes Part #. Ultima 40 Chrome Spoke 16 Rear Wheel 36-603. 87-4620 (slightly different then pictured). Frame cups & bearings Part# 12253. Rear axle kit part# DS223044. 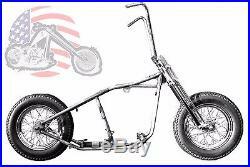 The item "Kraft Tech Chopper Bobber Rigid Hardtail Frame Springer Rolling Chassis Harley" is in sale since Friday, November 6, 2015. This item is in the category "eBay Motors\Parts & Accessories\Motorcycle Parts\Body & Frame\Frames".